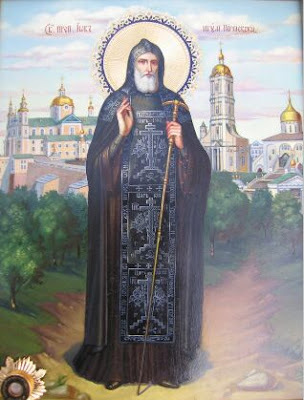 Saint Job of Pochaev was born about 1551 in southwest Galicia of a pious Orthodox family. In his tenth year the Saint departed for the Urgornitsky Monastery of our Saviour in the Carpathian Mountains. 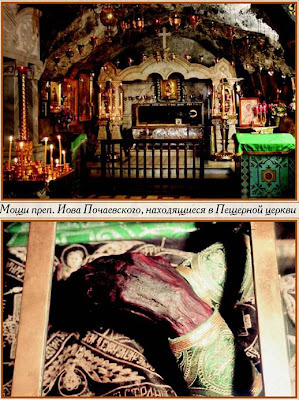 Tonsured after two years, he was ordained Hieromonk about 1580. Renowned for his meekness and humility, Job was invited by the great zealot for Holy Orthodoxy in Carpatho- Russia, Prince Constantine Ostroshky, to be Abbot of the Monastery of the Cross in Dubno. In his zeal for the preservation and propagation of the Orthodox Faith, and to counteract the propaganda of the Uniates, he printed and widely disseminated Orthodox spiritual and liturgical books. About 1600 he removed to the Mountain of Pochaev where at the insistance of the brethern, he became Abbot of the Monastery of the Dormition of the Theotokos, which he enlarged and made to flourish. Through his labours, a large printing works was founded at Pochaev and greatly assisted in the nurture of the Orthodox faithful in that region. His monastery became the center of the Orthodox Church in western Ukraine. The Saint reposed, having taken the schema with the name of John, in 1651, at the advanced age of one hundred. Saint Job of Pochaev died on October 28, 1651, and his relics were transferred to the church of the Holy Trinity on August 28, 1659. A second uncovering of the relics took place on August 28, 1833. In the year 1902, the Holy Synod decreed that on this day, August 28, the holy relics of St. Job be carried around the Dormition Cathedral of the Pochaev Lavra after the Divine Liturgy. Having acquired the patience of the long-suffering forefather, having resembled the Baptist in abstinence, and sharing the divine zeal of both, thou wast granted to receive their names, and wast a fearless preacher of the true Faith. In this way thou didst bring a multitude of monastics to Christ, and thou didst strengthen all the people in Orthodoxy, O Job, our holy Father. Pray that our souls be saved. Thou wast a pillar of the true Faith, a zealot of the commandments of the Gospel, a convicter of pride, an intercessor and teacher of the humble. Wherefore, ask that the forgiveness of sins be granted unto them that bless thee; and do thou keep thy community unharmed, O Job our Father, who dost resemble the much-suffering Patriarch.